When President Zelaya was removed in 2009 by a coup organised by the Honduran elite and its military, some voices said this was a one-off, and Latin America would not be turning off the path of democracy. Others, whose memories stretch back a little further to the 60s, 70s and 80s, when much of the continent was ruled by thugs in uniform, warned that the Right would always look for ways to get rid of left leaning politicians who they couldn’t remove at the ballot box. The shady men in shades and suits have struck again, this time in Paraguay. They seized their chance after a day of violence a week ago. The events – a clash between peasants occupying land and the security forces – left many dead. The Right blamed President Fernando Lugo, and organised an illegal ‘impeachment’ in record time (see here for an excellent summary by Mark Weisbrot in Friday’s Guardian). The South American regional grouping, UNASUR, immediately condemned the events as a coup. The United States, in words which echo their comments on the coup in Honduras, and their support for Muburak in Egypt and murderous regime in Bahrain, called for calm. “We understand that Paraguay’s Senate has voted to impeach President Lugo,” said Darla Jordan, a spokeswoman for the U.S. State Department’s Bureau of Western Hemisphere Affairs…“We urge all Paraguayans to act peacefully, with calm and responsibility, in the spirit of Paraguay’s democratic principles.”(quote from an analysis of the coup and the US links with the Paraguayan elite, by Shamus Cooke on ZNet). Much has been written in recent weeks of Obama’s hardline internal security measures, and the widening use of foreign assassinations, mostly by remote-controlled drones. To this can be added his support for 2 Latin America coups, something which his rightly vilified predecessor, George Dubya, failed to achieve. If Lugo is not re-instated quickly, then Paraguayans can expect to face the same level of oppression that has made Honduras murder capital of the world, and the most dangerous place to be a reporter. 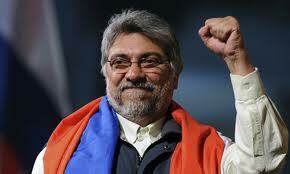 But it will all be done, no doubt, in accordance with “Paraguay’s democratic principles”. Two visitors from Nicaragua will be coming to North Wales next week, to strengthen the links between Wales and Nicaragua. On June 27 Arely Lopez and Emerson Silva Urbina will be meeting UNISON members in Colwyn Bay, and then speaking at a public meeting in the Daniel Owen Centre, Mold in the evening. The meeting is organised jointly by the Campaign and the Clwyd Latin America Human Rights Group. Arely and Emerson are members of the youth section of UNE, Nicaragua’s public sector union. The pair represent UNE at the highest level in Nicaragua, and internationally. The visit comes after two years of work by the Campaign working with UNISON to twin UNISON Cymru/Wales with UNE on Nicaragua’s Caribbean Coast. Mae 2 ymwelydd o Nicaragua yn dod i Ogledd Cymru yr wythnos nesaf, i gryfhau’r cysylltiadau rhwng Cymru a Nicaragua. Ar Fehefin 27 fydd Arely Lopez ac Emerson Silva Urbina yn cwrdd ag undebwyr UNSAIN ym Mae Colwyn, ac wedyn yn siarad mewn cyfarfod cyhoeddus yng Nghanolfan Daniel Owen yn y nos. Trefnir y cyfarfod gan yr Ymgyrch ac Ymgyrch Hawliau Dynol America Ladin Clwyd. Mae Arely ac Emerson yn aelodau o adran ieuenctid UNE, yr undeb sector cyhoeddus yn Nicaragua. Mae’r 2 yn cynrychioli UNE ar lefel uchel yn Nicaragua, ac yn rhyngwladol. Mae’r taith yn dod ar ol 2 flynedd o waith gan yr Ymgyrch, i weithio gyda UNSAIN i gefeillio UNSAIN Cymru gyda UNE ar arfordir y Caribi Nicaragua.